March 22, 2019, 1:32 AM · The other day I watched a video from my elementary school orchestra and I noticed that all the violinists were in the same part of the bow. Sounds good so far. The only problem was that it was the wrong place to be, right in the middle of the bow, and all down and up movement was compromised and hindered. We were in our comfort zone, each playing the same way as our stand partners. It really didn’t matter what we did as far as our parents were concerned, because we were smiling and sitting up in our chairs. As I grew up, I started moving my bow more, smiling less, and slumping more. I have been a pretty good rote learner, but moving the bow taught me the limitations of dry instruction. I knew the drill: look at the photo of the child playing in the three parts of the bow, move the wrist inward on the up bow and outward on the down bow, etc. It’s interesting how far plain, unimaginative instruction can take a child, but far more interesting how frustrating and limiting it can be. What a photo can’t show is the relationship between the bow hair and the string, and the geography of the strings themselves. I couldn’t wrap my brain around the sharp angles of the violin. While I didn’t succumb too often to touching two strings at once, I was meeting resistance at every bow and string change. My talent for perseverance was mitigated by severe lack of information. Fortunately, one day I happened upon a surprising realization. When I changed strings, I noticed that the tip traveled very far to change between two, very close, adjacent strings. This was jarring to me, because my perspective had always been that the strings were much closer together than they actually were. With this one lucky observation, I cleared up years of miscalculation and messy string changes. My rhythm got better as well. Pizzicato, on the other hand, always confirms how close those pesky little strings are. I could use a little lesson in relativity when I think about the differences between arco and pizzicato. Unless you’re wired to understand the nature of the bow, both its movements and its parts, you’ll fall into its traps. (Please let us know what it feels like to be wired correctly, Itzhak, Hillary, Joshua, Vilda, and Ray.) Getting stuck in the middle of the bow is caused by bow distribution that’s too uniform. If your bow speed and bow distance is the same for quarters, eighths, and sixteenths, the bow finds itself in the same place much of the time. A curious phenomenon is the orchestra that is drilled relentlessly to the point where the strings have identical bow distribution. I imagine George Szell and Fritz Reiner may have been some of the practitioners of such a discipline. Leonard Bernstein, Simon Rattle, and Christian Thielemann, and Mark Elder would be examples of the opposite type of method, but still a discipline of a different type. The perfection of the former has its pitfalls: a lack of grace, one-style-and- sound-fits all, unhappy musicians, etc. The advantages of the latter are freer, more flowing sound, and more colorful and rhythmic phrasing. Zubin Mehta sometimes asked strings in Bruckner symphonies to play with slightly uneven tremolos. It adds more depth and mystery to the sound. I wonder if any conductors ever ask for slightly uneven bow distribution. I guess it goes without saying that unless you ask for strict unison bowing, you’ll get a lot of individual differences without even trying. We all have our bow stories. I know that if the bow goes where it wants to go, it’ll end up careening over the bridge and drooping listlessly over the fingerboard. If the bow is warped, the possibilities are limitless. Wipeouts and crashes shouldn’t be the norm for the bow, but the design of our arms and of the bow itself lends itself to some messy trajectories. I prefer that the bow goes where I want it to go. I start with the guiding principle that my mind is guiding it. The moment the bow is left to its own devices, who knows where it’ll end up? Since the bow moves so fast, my mind needs to be one step ahead of it at all times. I can’t let a technique that I learned, such as going in and out with the wrist when I change direction, take over and possibly ruin the movement of the bow. Such a technique is a suggestion, not an overriding rule. Itzhak Perlman made an interesting comment in an interview with Alec Baldwin about students who have a particular talent for having a beautiful sound and elegant phrasing. Perlman suggested that these qualities are so special that it’s best for the teacher to not interfere with the child’s natural development. I agree, and wonder what it would take to damage such musical ability. One of the quirkiest teacher I had heard of might do some irreparable harm with his strange “advice-demand” that his students use the full bow on every note. Even Two-Set Violinists Brett Yang and Eddy Chen, who ask their guests to face the Ling Ling Challenge, don’t ask their guests to use full bow. That would be fun to watch. March 22, 2019 at 07:48 PM · After reading your article, I had a practice session and noticed that I am definitely stuck in the middle third of the bow! (I seem to be allergic to the other two thirds!) Your comment that "Getting stuck in the middle of the bow is caused by bow distribution that’s too uniform" is definitely true for me. Being conscious of this and not simply letting the bow "go where it wants to go" made a big improvement for me immediately. Thank you! March 22, 2019 at 08:18 PM · For me, I was never in the middle of the bow. With my long arms I was alway near the tip while others were middle of the bow. Eventually a professor suggested I switch to viola, which I tried for 2 years. But I came back to the violin eventually. March 23, 2019 at 12:27 AM · Working out the choreography of bowing is a major part of learning a new piece. Don't get locked in by some editor's opinions or performance tradition. Actually, the middle third is the best section of the bow to be in when there are a lot of fast string changes. The bow weight is balanced there. At the tip you need to move the arm farther. String changes at the frog are clumsy, and the fourth finger has to support the weight of the bow. March 23, 2019 at 12:28 PM · Michael, If I had to make a choice, I would rather be at the tip than the frog. I hated running out of bow at the frog AND feeling clunky at the same time. I use a system to keep me from running out of bow. As I approach either end, I imagine how much gas I have left. Then I adjust my bow speed accordingly, beat by beat, as the music progresses. That must have been quite a journey for you, playing the viola, then returning to the violin. 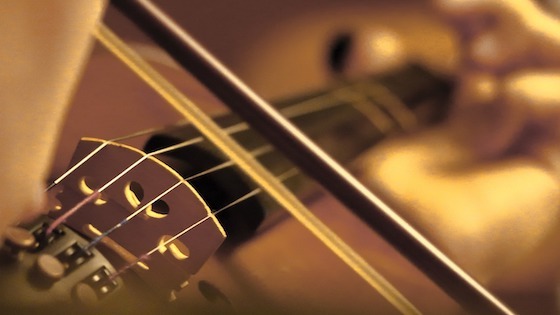 March 23, 2019 at 12:55 PM · @87, I have quite a few allergic reactions to the violin as well. Bow distribution is particularly complicated because no two measures are the same. I hope you enjoy the process! March 23, 2019 at 03:22 PM · The Sevcik etudes seem to lick the problem if his directions (abbreviated underneath at the beginning) are practiced. March 28, 2019 at 02:46 PM · Buy a nice enough bow and the price will make you learn how to use every inch (or cm)! A bow by Dominique Peccatte, even a “player’s bow” and not an example you’d be fighting the collectors for, can easily cost you $3,000 per inch. Stephen Shipps told me about his clever trick to train students who didn’t use the whole bow. Trade them their bow for a small fractional-sized bow for a week, and they come back able to play at the frog. I’ve also gotten a lot of benefit by playing passages with the bow going the opposite way, or at what seems to be the least comfortable spot in the bow. March 28, 2019 at 07:51 PM · One of my teachers told me, "You paid for the entire bow, you might as well use it." Indeed, when I find my tone becoming weak and strained, it's often because I'm using tiny strokes in the middle of the bow. A quick reminder to myself to use the whole bow usually fixes things up. Our orchestra is currently working on Schubert's 9th symphony. We violists have a passage where we play several bars of tremolo followed by several loud notes. You can't just play tremolo in the middle of the bow; you have to work your way toward the frog while doing so, in order to be ready for the big notes to come. I do the tremolo with my wrist, while my shoulder slowly moves the entire bow toward the frog.